continued to fight until his death around 1780. 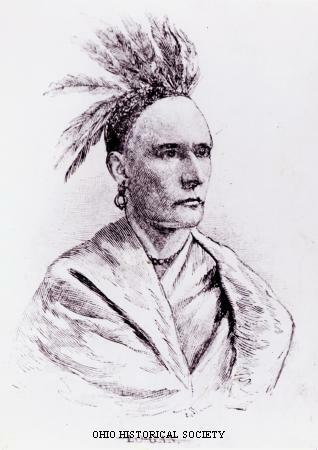 Logan was a prominent Cayuga leader. He was a war leader but often urged his fellow Cayuga not to attack whites settling in the Ohio Country. His attitude changed on May 3, 1774, when a group of Virginia settlers murdered approximately one dozen Cayuga. Among them were Logan's mother and sister. Logan demanded that the Cayugas and their allies, principally the Shawnee, take revenge for the deaths of his loved ones. Cornstalk, one of the important leaders of the Shawnee, still called for peace, but Logan ignored him. He conducted raids in western Pennsylvania, killing thirteen whites in retaliation for the deaths of the Cayuga. Logan's attacks, plus mounting aggression from encroaching Anglo-American settler-colonists, culminated in Lord Dunsmore's War . The English eventually defeated the Cayuga, and the two sides met near Chillicothe to determine peace terms. Logan refused to attend but did send a speech known as "Logan's Lament." Simon Girty, an Englishman kidnapped by the natives and then raised as one of their own, may have read it at the conference. It became one of the most famous speeches by an American Indian in American history. Logan spent the remainder of his life trying to prevent white settlers from moving into the Ohio Country. During the American Revolution, he continued to raid white settlements in Pennsylvania. Most accounts describe Logan as becoming despondent and turning to alcohol after his family's murder. He probably died around 1780. Logan's Iruoquoian name continues to be the subject of some dispute. He has been identified over the past two centuries as Tah-ga-jute, Tachnechdorus, Soyechtowa, Tocaniodoragon and Talgayeeta.